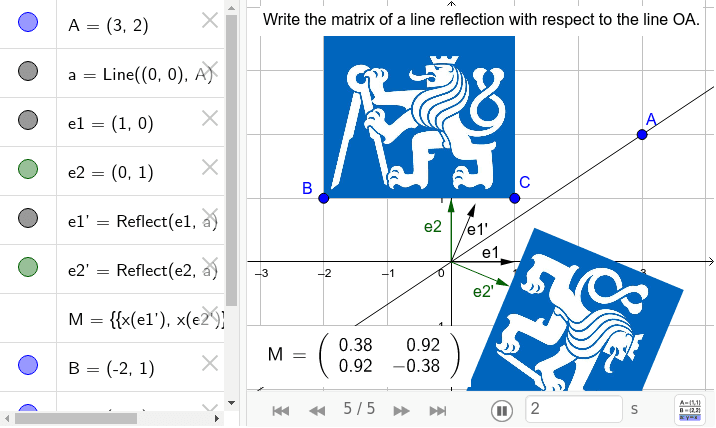 Write the matrix representation of a line reflection with respect to the line OA. Thus line of reflection pass through the origin the transformation is linear and could be expressed by 2 x 2 matrix. 1. Reflect base vectors e1, e2. 2. Images e1' and e2' are columns of the matrix of linear transformation. 3. Check the representation by means of the image "lev" (lion). Move with point A to get the integer representation. Compute the determinant of transformation matrix.